In the beginning of March Associate Professor Oksana Dubnyakova was invited at University Mediazione Lingustica, Perugia, and Roma Tre University, Rome, to hold a series of lectures and workshops on Russian language and culture. In Perugia Professor Dubnyakova spoke for the teachers and students of the translation course implemented jointly by University Mediazione Lingustica and University for Foreigners Perugia. 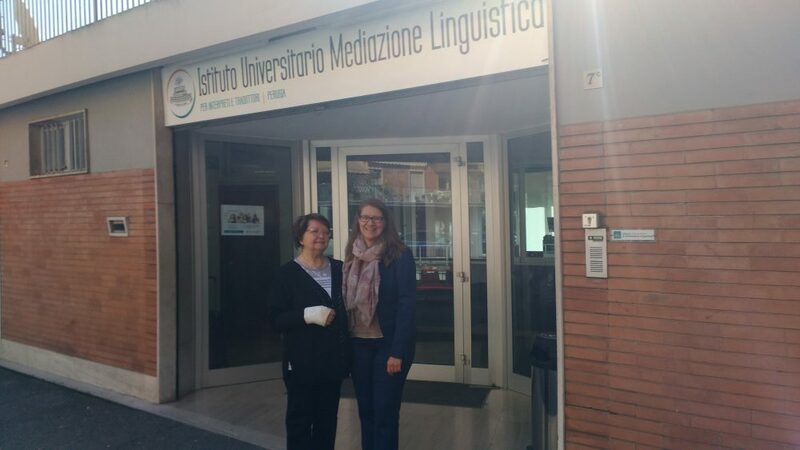 During the visit, Professor met with Administrative Director Catia Caponecchi and Director of Studies Isabella Preziosi and discussed the prospects of cooperation between and University Mediazione Lingustica and the MCU’s Institute of Foreign Languages. At Roma Tre Professor held lectures and speaking practice seminars for the students majoring in foreign languages and met with Associate Professor Valentina Benigni, Head of the Russian Language and Translation Department. The topics of presentations in Russian and Italian featured “Comparative analysis of Russian and Italian dialects”, “Literary analysis of ‘Student’ by Anton Chekhov”, “Russian songs as linguistic aspect of Russian culture”.